Alberti design, manufacture and provide high quality precision angle heads for manufacturing companies seeking the highest productivity and performance. The company's whole goal and structure is targeted to meet the demands of a discerning niche market worldwide and to offer optimum standard or custom-made solutions to their customers. Alberti began production in 1986 and within only a few years their products and solutions have come to dominate the international marketplace. This is simply due to the quality, functionality and reliability of their products. Nikken Europe is delighted to be able to add these products and developments to their portfolio for customers around Europe to take full advantage from. 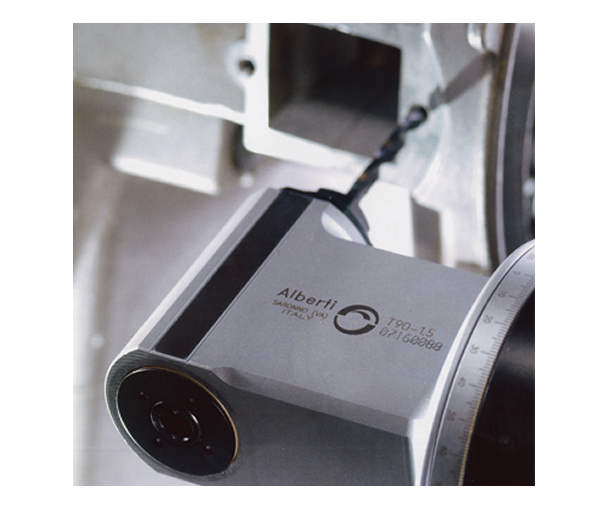 The Alberti standard angle head range is broken down into five main product areas all available on multiple input shanks to suit any machine (DIN/ISO/BT/HSK/CAPTO etc). Nikken Europe are delighted to be able to offer exclusively a selection of Alberti Standard Angle Head sizes now available with optional Nikken SK eight degree Output Spindles.